The Anton Bauer Digital G90 Gold Mount Battery Kit features Anton Bauer's new Digital Series G90 93 Watt-hour Lithium-Ion batteries. The Anton Bauer standard gold mount also includes a P-Tap connector for powering various accessories. The new batteries have a digital LCD on the side that conveniently displays the time in hours and minutes left when power is being drawn from the battery. When no device is connected or no power is being drawn, the display shifts over to a percentage of capacity remaining. A rubber jacket surrounding the battery helps protect against accidental drops, something the old plastic housing on Dionic series was notorious for. 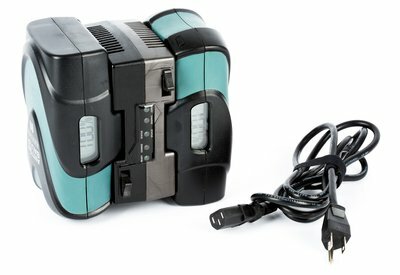 Our kit includes 2x G90 14.4V, 93 Wh Batteries and 1x Twin Charger allowing for sequential charging.